During the red onion season there was a hive of activity and the Assistant Commissioner in Jaffna ran round in circles attending to purchasing red onions and dispatching them by the wagon load to Tripoli as well as to cities like Galle. Once, I covered the Galle District from my headquarters at Ambalantota. I can remember an instance regarding the sale of red onions in Galle. Wagonloads of red onions came from Jaffna. We sold to the traders at a wholesale price and also sold at a cheap rate in our retail unit at Galle. It was my task to see that traders were provided with red onions and also to see that our retail shop never ran out of red onions. I was in Galle on a certain day and everything was in order. I got back to Ambalantota my headquarters by night. The next morning when I went to my office, I received a telegram from Head office. 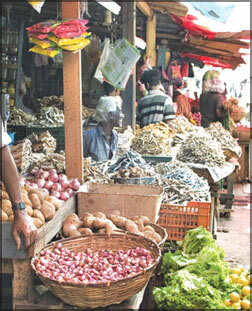 It read 'MP for Galle, Dahanayake reports shortage of Red Onions in Galle. Proceed immediately, inquire and report.' I hooked into my car in anger - it always had my toiletries and extra clothes. I was back on my way to Galle, driving as fast as my Peugeot 203 would take me. I went to a number of private retailers observing whether they had red onions and finding the sale price. I went to our retail unit and found they had ample stocks. I had my network of private informants whom I contacted and was satisfied that our shops functioned well. I always built up a private spy service of friends. Then I went to meet Dahanayake. He was not at home and I waited till he came. It was hours but I had to meet him. He came home at around ten o' clock in the night and was surprised to see me waiting for him. I showed him the telegram and told him that there was no shortage of red onions at all in Galle. He looked hard at me for a moment. I knew him well and was in constant touch with him. It was strange and I wondered for a moment. 'You know, Garvin, we have to please our voters. Some fellow came and told it to me and to keep him happy I sent a telegram to your Ministry', I asked for the name of his informant and was told that he cannot remember. I pointed out that this telegram gave the impression to my Ministry that I was not doing my work well. 'That is politics,' he said. Next time I go to the Ministry I will tell the Minister that everything is satisfactory. Tell me if you have any problem? That was all. I submitted a report of my investigation and what Dahanayake told me, and the Ministry took no further action. Evidently Dahanayake had contacted the Ministry. We, Assistant Commissioners were always on pins. Working with politicians was always demanding. Politicians were of two categories. One group was the Minister and the Deputy Minister in the Ministry under whom the Department functioned. The other category happened to be the politicians in the Districts where we worked like Dahanayake. At times it so happens that the requests of the District Members of Parliament cannot be accomplished by us. A clash ensues and we get transferred overnight to please the District Member of Parliament. We are even kept in quarantine for a short while to please the Member of Parliament - to give him the impression that we are punished. Eventually we are given a kick upstairs. We administrators get used to this play of politics. The Marketing Department also made van sales. Van sales on the streets in cities was done when there were quantities that could not be easily sold at our normal outlets. A van with a Marketing Officer or a Manager would be sent out to attend to street sales. The sales will go on till late in the night at times till our stocks were sold. Our officers had to work round the clock when the necessity arose. The Assistant Commissioners in the Districts advised the producers what varieties should be produced - this was based on the demand. They attended divisional meetings chaired by the Divisional Revenue Officers (later Assistant Government Agents) and worked through various cooperative and rural development societies. We laid a dragnet covering all producer fairs in the island and visited them to see that the traders offered reasonable prices to the producers. We were known to the traders and they were aware that if they offered low prices, one of our mobile purchasing units will be sent the very next week. Overall the Marketing Department did purchase less than ten percent of the crop, but we really ruled the day to determine the prices for the producers as well as the prices in the cities. A Bakery was established in Colombo which produced bread, cakes and short eats and sold to consumers at reasonable rates. This Bakery proved to the bakers that they could easily manage to get a profit and offer the bread at the controlled price. Today most loaves of bread offered for sale in the cities are short weight. This Bakery was closed down by the UNP Government. The Marketing Department also had a Hospital Supplies Branch that supplied the requirements of vegetables, fruits and essential commodities to the main hospitals. The idea was that the hospitals would get good quality supplies at a rate cheaper than local traders. In the case of main hospitals there was a unit with an Assistant Manager who had to order supplies from Tripoli Market or one of our main depots at Kandy etc. and buy the rest at cheap prices at local Fairs. At times problems cropped up and were solved. At times though good quality fruits were supplied by us, by the time the fruits reached the patients at meal time, it was not the same fruit. The Department got the blame. Once I remember one of our Assistant Commissioners stood in as a patient on a hospital bed, with a bed head ticket, unknown to the hospital staff other than the doctor in charge, to prove what was happening. The Marketing Department was really built up overnight by Commissioner Basset. That will explain why many units even when I joined in 1955 were housed in wooden sheds. There was no time to plan and make up buildings. It was a case of a cement base for the floor, wooden uprights and walls built of timber - a structure that was put up within a few days.